My name is April and I greet you with a warm and hearty handshake. I work with our Lakota families at St. Joseph’s, along with many other roles. I would like to take this opportunity to share with you about why I am at St. Joseph’s Indian School. I guess I can start by sharing a quote from our Elders. They say everything happens for a reason and when one door closes, another opens. A long time ago … and I mean a long time ago… when my children were playing basketball and football, I would come to St. Joseph’s for their games. The first time we drove into campus, I was so impressed. The first thought that entered my mind was I would love to work here. Time went on and I began my journey of healing back in 1986. Little did I know at that time, I needed to do what the little sacred spirits at St. Joseph’s are doing today… I wanted to learn who I really was and about my culture. So I decided to go to treatment. Things were not good and I wanted to know why I was making so many wrong choices. 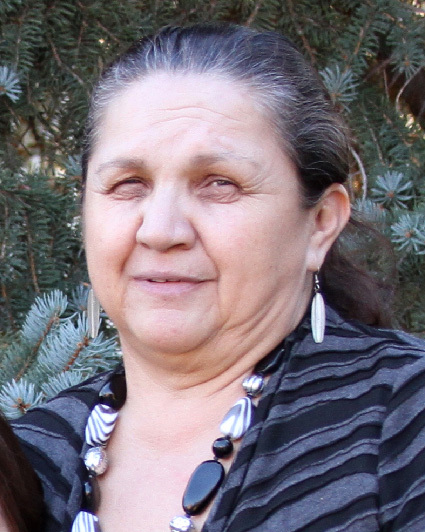 With the help of my Hunka relatives (adopted through a traditional Lakota ceremony), Mr. Gene Thin Elk and Rick Thomas, I was able to start building a foundation for myself and learned how to make some positive choices. I thank the Grandfathers every day for giving me a second chance. This time I would show my children a clean and sober mommy. There were many steps I needed to take to do just that. I have been alcohol and drug free for 28 years. Through the years, I decided I wanted to help my relatives in a good way, the best way I knew how. I felt so good on the inside knowing that I had nothing to hide and that I had a voice in a good way, to share with others that it’s okay to cry and to laugh. 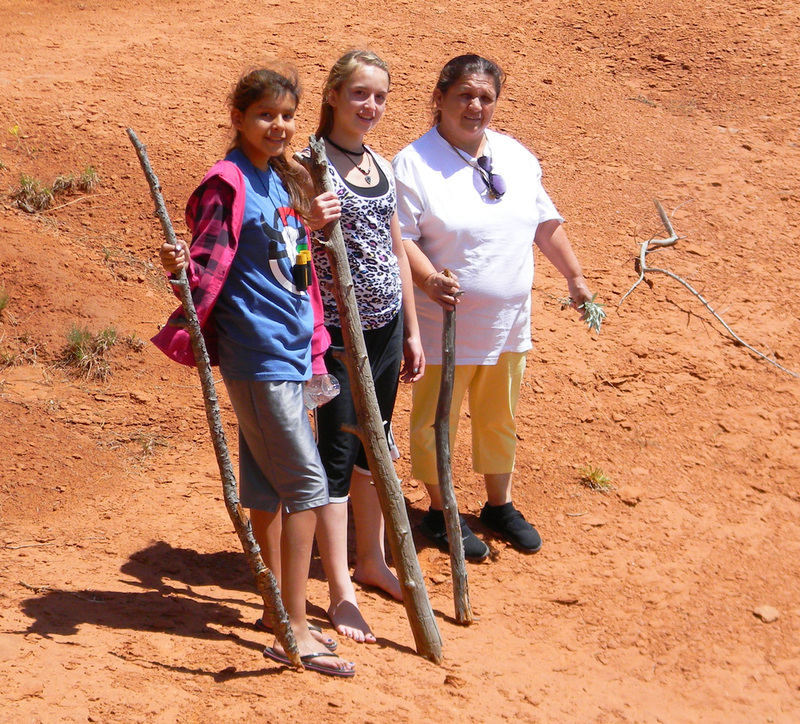 April and the Lakota (Sioux) students during their cultural trip. The Elders say that tears and laughter are the two best medicines that we have. I strongly believe that. Our Elders also say that each one of us are gifted. Maybe we don’t know yet what that gift is, but others will see it and tell us because of the way we choose to walk. I was raised as a strong Catholic; my parents had us in church every Sunday. And God Bless my mom who shared with me and my siblings that it is ok to carry a Bible in one hand and the Canupa – pipe – in the other. Never forget where you come from and don’t ever disrespect others, she said. My mom was a great teacher, along with my dad. Both are now in the Spirit World. As a result of all this, I strongly believe I was guided here to help our little Native Spirits feel comfortable and re-learn that it’s ok to talk with another person – our clergy, counselors, houseparents, teachers or mentors. Each child is different and come with their own little stories that we can learn from together and help them to the best of our ability. Maybe I can also be a grandma they don’t have, or to model the grandma (Elder), and share what I have learned through the years before I came here. I hope we can all keep learning together. Thank you for sharing your story April.. May God keep blessing you and your work! April! You are a beautiful person- and, an incredible asset to the School. I could feel your story all the way out here in Massachusetts. You are one of many people, with similar stories, that knew enough not to give up- to move forward with their life in finding themselves, and then, doing something to benefit others. God Loves People like this- and, He’s looking for People, like this, to be on His TEAM! I want to send, to you, a small pamphlet that I had ordered. It’s small, but it’s ten feet tall. April, yours is a story of resilience and courage. I’m so glad that your life is fulfilling at the St. Joseph Indian School. Sometimes our life experiences teach us how to help others to help themselves.